What should Freethinking parents teach their children about the Bible? Antediluvian — meaning old, is, literally, "before the flood." "The Four Horseman of the Apocalypse" — even if you don't know them, you should know that they're not on the Olympic equestrian team! And we could certainly think of many more examples of words, idioms, sayings and clichés that have their roots in the Bible. Likewise, how could an intelligent person possibly understand the last 2000 years — and even more, perhaps — of history without knowing anything about the Bible? The Bible is, in part, the reason that there was a Dark Ages. It's part of the reason why European politics worked the way it did for the last 1000+ years. It's why the Crusades were fought and the Inquisition happened. It was used to justify the subjugation of "the heathen" all over the world for hundreds of years from the fifteenth century on. 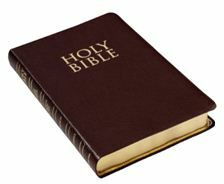 The Bible also played an important role in the Reformation, in King Henry VIII's break with the Roman church, and, of course, it was one of the first books to be printed with Gutenberg's movable type. Just to be told that the Bible and its teachings were responsible for these things is not enough, though. An intelligent person — which is what we want our kids to be — needs to know the how and the why of it. We should not follow the example of believers who try to "protect" their children by keeping them in ignorance. Of course, the usual Bible story books for children that are sanitized and falsified for the purpose of indoctrination are not recommended. And teaching children anything about the Bible can wait until they are old enough to grasp the real issues involved. Usually, by the time they get to be 8 or 9 years old. they are ready to be acquainted with the traditional stories of Adam and Eve, Noah and the Ark, Jonah and the Whale, Job, and so on. that there are really two creation stories in Genesis. In one God creates all the plants and animals and then humans. In the other he creates Adam and only later makes other plants and animals and even brings the animals before Adam to see if any are a "help meet" for him. Only when Adam rejects the companionship of everything from rhinos to lobsters does God decide that maybe Adam needs a woman! that the "one God" of the Bible is clearly a group or committee of deities in places where the editors forgot to make "corrections"
Read the Cain and Abel story as well — and ask: why does God not have "respect" for Cain's offering? Nowhere in the story does it say. Similar problems exist with respect to the Noachian Flood story. After Noah is told to and takes two of every animal into his gopherwood ark, God comes back and tells him to take seven of every "clean" animal. And God hadn't even told anyone yet which animals were "clean" and "unclean!" Again, the later editors weren't thorough. Of course, there's also the delightful story of how God tells Abraham to kill his son Isaac and how Abraham is more than willing to do it. But this story should not be told without also telling the later story of Jephthah's daughter (it begins at Judges 11:30). This time it is the "man of God" who, with the idea that he is keeping a promise to God, goes ahead and does kill his daughter, whose name we never even learn. No sheep caught in a thicket for Jephthah's daughter! Also of note is that God "hardens the heart" of Pharaoh in Exodus — and then punishes him for it! This is an important passage because it bears on Saint Paul's analysis of who is to blame when an all-powerful God allows — and even causes — bad things to happen. There are lots of other things of this kind that children need to learn about the Bible and its teachings. But the purpose of this kind of instruction is not to persuade our kids that the Bible is a terrible book. The purpose is to educate them as to what the Bible actually is: a collection of material that is part myth, part history (though not much! ), part philosophy and a very large reflection of the people and the times in which it was written and rewritten for their purposes. Freethinking children need to be educated about the Bible in a way that is honest, straightforward, and rational. This book, despite the foolish claims made for it, is a part of the heritage of our civilization and all who are part of it, including our kids. We should not want our children to think that anyone who sees anything of value in the Bible is an evil person. But we do want them to appreciate that anyone who thinks this book is the "Word of God" has either not read it, doesn't understand it, or is badly mistaken if not delusional!